Today we’re very pleased to announce Supermetrics for BigQuery, the first ever native BigQuery Data Transfer Service app for non-Google marketing platforms such as Facebook, Instagram, Linkedin, Twitter, and Bing. After Google’s announcement at the Cloud Next conference, Supermetrics for BigQuery is now available. It’s by far the simplest and most user-friendly way to transfer marketing data from non-Google platforms to your data warehouse in BigQuery. 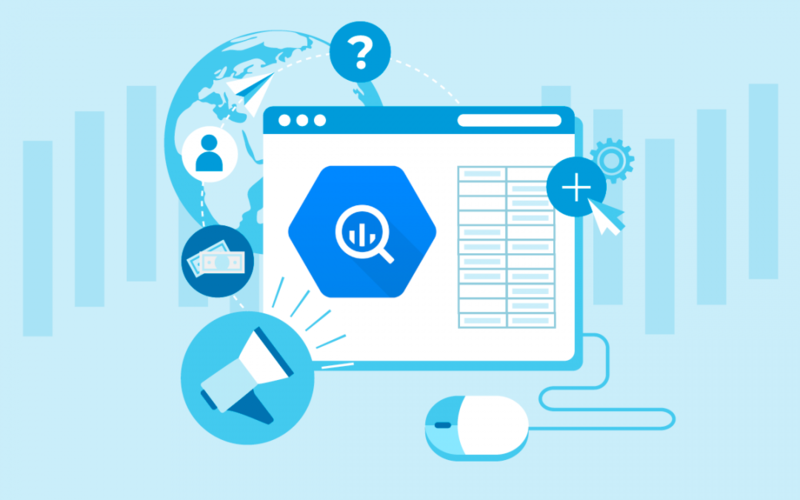 In this post we want to give you an overview to BigQuery, the benefits and why you should use it for marketing, and how to get started with Supermetrics for BigQuery. BigQuery is a cloud-based data warehouse that lets developers and marketers tap into powerful data analytics on demand. It’s a fully managed service, so you don’t have to worry about the underlying IT infrastructure, how big your data is, or how you want to analyze the data. Since it’s a part of the Google Cloud Platform, you’re essentially leveraging Google’s infrastructure to power fast and flexible analysis over gigantic data sets. It’s super easy to use, super fast, and super scalable. A major differentiator of BigQuery is that it separates compute from storage in its pricing. The storage is extremely cheap and you primarily pay for querying the data, so your cost structure will be closely aligned with the value of your business cases such as reporting and analysis. And although BigQuery itself doesn’t offer any visualization features, we built a new connector that lets you pull your data from BigQuery directly into Google Data Studio with Supermetrics so you can build your own custom reports and dashboards. You can also integrate BigQuery with other BI tools such as Looker and Tableau. Why did we build Supermetrics for BigQuery? Supermetrics was started with a simple mission: help marketers move their data from wherever it is to whichever tools they want to use the data in. On one side, we integrate with the most popular PPC, SEO, social, web analytics and other marketing platforms as data sources. On the other side, we’ve connected to several data destinations including Google Sheets, Google Data Studio, and Microsoft Excel. Expanding our supported data destinations to data warehouses like BigQuery is a natural next step in freeing data for marketers across the globe. BigQuery is built for engineers, or large companies with abundant engineering resources to support their marketing departments. We want to unlock the potential of BigQuery for all marketers and companies of all sizes by making it approachable and usable for everyone. We designed every single component of Supermetrics for BigQuery and the entire workflow with marketers in mind. Our friends at Google contacted us about six months ago asking if we wanted to work with them on this new product for BigQuery. They trusted our capabilities of building reliable and scalable solutions, as well as the quality of our integrations with marketing platforms. It’s largely based on the success of Supermetrics for Google Sheets and Supermetrics for Data Studio, with a combined user base of over 400,000 marketers worldwide. We believe this is perfectly aligned with our mission and is a great opportunity to leverage the best-in-class marketing data pipeline infrastructure we’ve built. So we decided to seize it and the rest is history. Here we would like to give a special thanks to the BigQuery team and the Google Analytics team for placing their trust in us! Why use BigQuery for marketing? If you run online marketing, the chances are, you probably use several marketing platforms such as Google Analytics, Google Ads, Facebook, other advertising networks, your CRM, e-commerce platform, and the list goes on. You probably have your data all over the place and wonder where the data should live. You may also have a number of processes already in place to collect data for reporting in spreadsheets, data visualization platforms, or reporting tools. But getting your marketing data fully under control is no simple feat. It still resides in each marketing platform and you’re collecting it on the fly, which limits your ability to fetch and analyze large datasets, as well as combine data from different sources. When you’re fetching data for a long time period and at a high granularity, the data volume can be massive. Let’s say you want to get your Facebook Ads data for the past five years at the ad level and break it down by demographics like geography, gender, and age. There is a good chance that data export may fail, or if you’re lucky, it takes several minutes to return the data you need. As a matter of fact, you may not get all the historical data you want because of the inherent limits of some platforms. With BigQuery, the data is extracted from marketing platforms and loaded into your data warehouse before you need it, so you never have to worry about the speed or reliability of data transfers. With Supermetrics, your data is also transformed into the format you need so there is no need to clean or normalize the data yourself. The end result is, you have all your marketing data in your data warehouse in BigQuery. In minutes. The flexibility and feasibility of blending data from different sources is one of the top purposes of building marketing data warehouses. Only with the data blended together can you get a single data source of truth. A common use case is linking advertising data with web analytics data to gain insights on and steer advertising campaigns. You could evaluate the quality of your paid traffic by analyzing how the users behave after landing on your site. Or you could answer questions like why the purchases from a certain customer segment always increase after a particular type of campaign. If you’re recording user IDs for your website visitors and are passing the IDs to Salesforce, you can export both your Google Analytics and Salesforce data to BigQuery, and link them together against the user IDs. It gives you a whole new world of analysis possibilities such as how website traffic sources are correlated with customer cohorts of different LTV (Customer Lifetime Value). Many marketing platforms have limits on how much historical data you can get, either in the native UI or through the API: Google Search Console, Linkedin Ads, just to name a few. For example, Google Search Console only offers 6 months of historical data in the user interface. With its Analytics API or 3rd-party applications built on top of the API such as Supermetrics for Google Sheets and Supermetrics for Data Studio, you can get as much as 16 months of historical data. However, it still means you forever lose your data older than 16 month One of the biggest drivers for building a data warehouse is to store historical data so you’ll never lose it, which allows you to analyze massive amounts of historical data to gain insights. When you export data to BigQuery, you can often have your data at a higher granularity than what you can get in the native user interface. This provides the needed flexibility to perform analyses that aren’t available in the interface. BigQuery enables completely new ways of modeling and reporting your data. For instance, when you transfer your Google Analytics or Adobe Analytics data to BigQuery, you can get the data at the event or user level. Let’s say you’re an e-commerce business, you may want to perform deep path analysis to answer questions like what are the most common page paths of your website visitors, and how are the paths different between buyers and window shoppers. This isn’t possible in the native UIs since they don’t provide raw events data. With hit-level data stored in BigQuery, however, you get the needed flexibility to model the data to show the most common page paths. Now you’ve decided to build a marketing data warehouse in BigQuery. And then what? Although moving data to BigQuery may sound easy, it’s not without ready-made solutions. You will have to hire a team of developers to spend years building the integrations with marketing platforms, which is incredibly time-consuming and error-prone. Not only do you need to build these integrations, but the maintenance can become a much bigger hassle. With companies like Google and Facebook constantly updating their platforms, the APIs are changing all the time. It comes to the classic buy vs. build decision. Unless you’re Google or Facebook with unlimited engineering resources, why should you build and maintain all these connections yourself? Also, it frees up your IT team from coding and maintaining the integrations and frees up your data team from boring manual data transfer and transformation. Everyone can focus on the high-value activities instead. It could save you a huge amount of time and money to use a managed data pipeline service like Supermetrics for BigQuery than building it yourself. What’s special about Supermetrics for BigQuery? First of all, Supermetrics for BigQuery is built by marketers, for marketers. We want to help marketers harness the power of BigQuery with minimal technical knowledge and without the dependency on developers. All other data pipeline services are designed for developers, data engineers, or technical analysts. Their job is to build, maintain, and transfer data to data warehouses. As a marketer, the technical details of how the data is moved isn’t necessarily among your top concerns and you most likely won’t enjoy the complicated configuration of those services. Supermetrics for BigQuery is designed exactly for marketers like yourself. In just a few clicks and a couple of minutes you’ll have your marketing data warehouse up and running in BigQuery. Then you can pull your data to Google Data Studio, using the Supermetrics connector, or other BI tools to build dashboards and analyze your data. Another important differentiator of Supermetrics for BigQuery is that we pre-transform the data into the format marketers need before loading it into data warehouses. We offer top-notch predefined schemas so the data doesn’t have to be transformed again after being loaded. Don’t know what schema is? Simply put, the schema is a logical description of your data tables. It basically tells you how data tables are structured and organized. The reason for this is that, again, most data pipeline products are optimized for technical users, not marketers. They usually extract all the raw data from the APIs and load it into dozens of tables, with the assumption their users can write complex SQL queries to join data from multiple tables to get the data they need. We know not every user of marketing data warehouses has that level of technical competency. Even for those who can, it isn’t the most enjoyable part of their work. Aiming to take this hassle away, we talked to hundreds of companies using marketing data warehouses, learned how they would like to use the data, and designed our schemas to make sure the data is transformed in the format marketers want. Supermetrics for BigQuery is also the first and only application that lets you transfer non-Google data and set up your data transfers within the BigQuery interface, which is on a par with Google’s native Data Transfer Service in terms of usability. If you ever used our Data Studio connectors and compared them to alternative solutions, it’s quite similar in that all other applications require you configure the data transfer in an external interface while Supermetrics doesn’t. Supermetrics for BigQuery has more metrics and dimensions available than any other 3rd-party application with the most robust integrations to PPC, SEO, social, and analytics platforms. Some reporting tools and data pipeline services cover the same data sources but their integrations are rather shallow in that they only cover the basic metrics and dimensions like costs, clicks, impressions for Google Ads. In many cases you can’t get all the data you want through those platforms due to the shallow integrations but with Supermetrics you can really dig deep into your data. Marketing platform APIs can often be slow or unreliable, especially when you’re fetching large datasets on the fly. We’ve done a lot behind the scenes to optimize the speed and robustness of these integrations and our Google Sheets add-on and Data Studio connectors have been proven to be rock solid. Gets data from all your BigQuery tables with one data source instance. Google’s own BigQuery connector plugs into just one table at a time, or you need to write SQL to combine tables. Automatically merges data from different sources together, without needing to write SQL. It can merge data from not only our different BigQuery connectors like Google Ads and Facebook Ads, but also your other sources if they use the same naming conventions. Automatically sets data types for fields, so Data Studio understands for example that a certain field contains countries and can display those on a map, or for fields containing an ad image URL our connector can retrieve the actual image in the report. Automatically sets friendly names for fields, so reports display for instance “Account name” instead of “account_name” as what you usually have in BigQuery. Automatically adds calculated metrics like CTR. Normally the user would need to define the formulas for these. Adds time fields like week, month and year. Normally you would only have a date field and the user would need to configure the rest. This video will show you how to get set up and run your first data transfer in just a few minutes. We’re excited to launch Supermetrics for BigQuery so you can leverage the processing power of Google’s powerful data warehouse. To experience and unlock the power of BigQuery right now, simply go to the Google Cloud Platform Marketplace and start a 14-day free trial of Supermetrics for BigQuery today. Or book a demo with our team to learn more about our new product product and how you can benefit from BigQuery.